The movie still isn't out for another 2 1/2 weeks, but I'm already hitting my third review of action figures based on the new Star Trek film. If nothing else, Playmates Toys has certainly hit this license hard right out of the gate. Too bad they were holding the ugly stick at the time. I looked at a few of the 3 3/4" (called the Galaxy Collection), and wasn't too happy. Then I checked out the 12" series (called the Command Collection), and was happier, although still not dancing in the aisles. It's time to finish up the scales by looking at the 6" figures, called the Warp Collection. Like the smaller Galaxy Collection, the first wave of the Warp Collection includes ten characters. I picked up three to start: Kirk, Spock and Uhura. you can find these at most local stores for around $10 a pop, or I have some online suggestions at the end of the review where they are about the same price. The theme across all the packages is identical of course, but these aren't quite as easy to open and re-close as the smaller series. You can still cut the tape on the sides, and cut the plastic across the bottom, but because of the design of the top of the bubble, when you lift it the card back tends to get torn. There's not much personalization either, always a sort spot with me. And while the funky shape of the bubble is attractive, it's a huge pain for MOCers to store. And don't even get me started on the twisties. Spock had five on himself along, with another one around the belt. Have the wire clippers handy when you're ready to crack these open. Unfortunately, the Kirk sculpt isn't any better here than on any of the other scales. In fact, I still think the closest they've gotten is with the 12" figure, but I think Jessica Alba and I are close because we both live on the same planet, too. For some reason that I can't comprehend, Kirk looks like a 16 year old kid in ever scale, but perhaps it's the worst here. 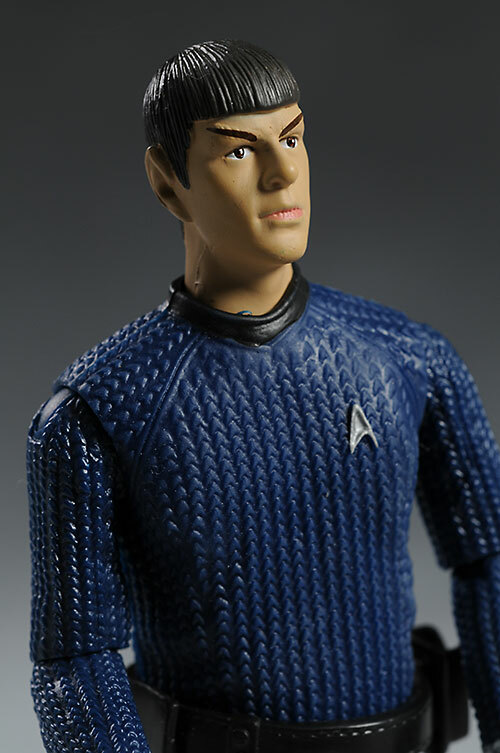 The head is large enough to make the weird shape and childlike features obvious, and he stands out in contrast with the much better Spock and Uhura. 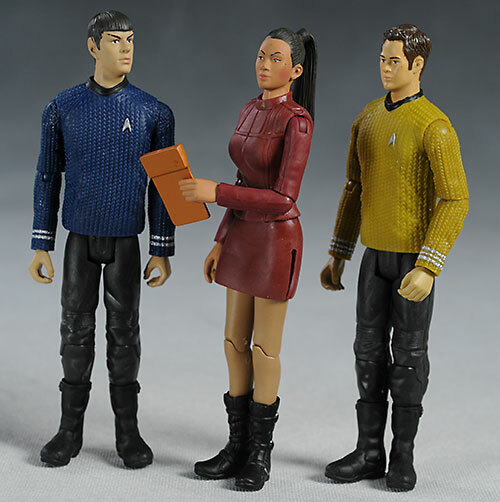 Now, let's not get nuts here - neither Spock or Uhura above the standard average of most 6" scale figures these days. But Spock is accurate enough to know who it is, and not just that it's Spock, but that it's the Quinto Spock. 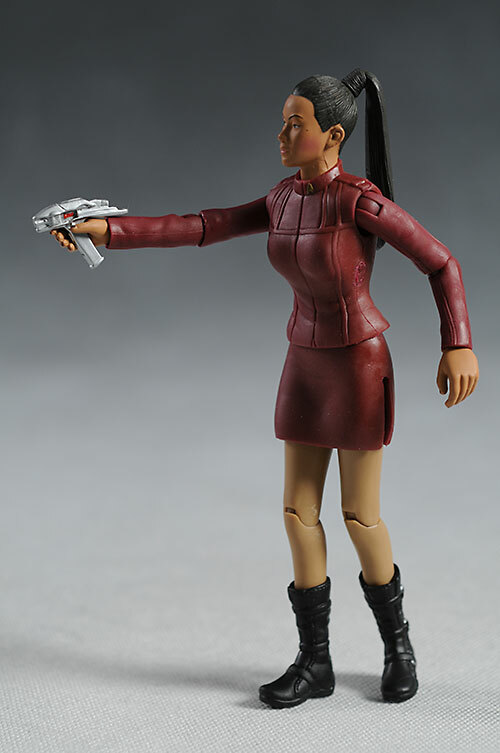 Uhura's head sculpt goes further than that, actually portraying an attractive woman, something similar lines like Marvel Legends have had an awfully hard time doing over the years. As you'll see in the next section, the paint doesn't do a lot to support it, but at least the underlying sculpt is reasonable. Whether you like the sculpted 'sweaters' or not is going to be a personal preference. For me, they certainly look better in person than I was expecting. Likewise, the soft rubber that comprises the torso section of shirt may or may not be to your liking. It does tend to attract and hold dust, and we'll have to wait a year or two to see how well it holds up. Underneath the shirt is crudely sculpted muscle definition. I'm not sure why, unless it's to give the softer rubber shirt a more realistic appearance. It's certainly not for them to go shirtless - the musculature looks like it done by a 16th century wood carver. 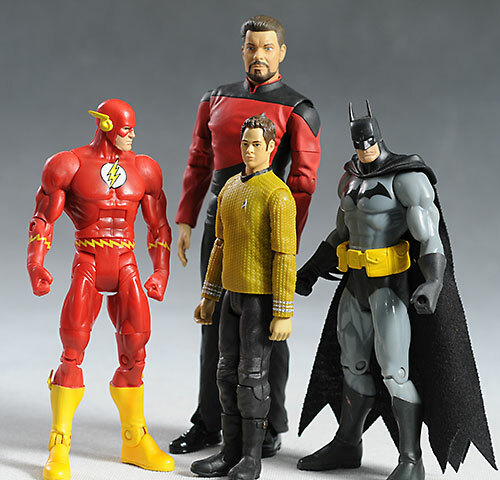 The body proportions are decent with the exception of Kirk's slightly undersized head. The males stand just about 6" tall, with Uhura a hair shorter, so unlike the smaller line, the do fit in reasonable well with other 6" scaled lines. The proportions are more realistic, so they aren't as buff as something like the DC Universe figures, but it seems fairly appropriate. I suspect that the quality of the paint ops varies pretty widely across this series. I had the best luck with Spock, who has relatively clean cut lines, a good hair line, and even eyes. The stripes on his sleeves and the edge of his collar are a little sloppy, but it's reasonable work considering the price point. 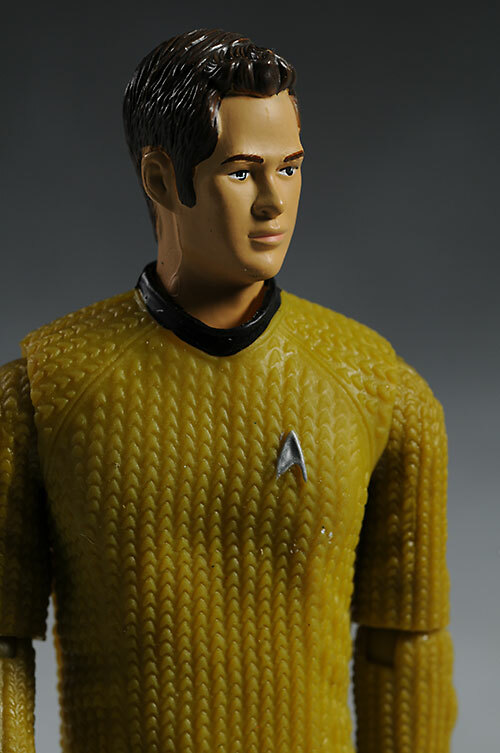 Kirk has a few more issues with the critical paint on the eyes, eyebrows and hair. The hairline is uneven, with skin tone ending up where it shouldn't, and the eyes and eyebrows are both slightly off. The paint fails to do it's most important job - improve the look of the head sculpt. Uhura had the potential to be the best, working from a pretty head sculpt. However, mine has stray marks on her face and nose, a sloppy hair line, rub marks in the hair, and a blush on her cheeks that is too distinct, making it (and her) look cheap and gaudy. Cheap and gaudy ain't a bad thing when it comes to real women, but the 100% plastic kind deserve a little more dignity. I know I've been spoiled by the DC Universe and Masters of the Universe Classics from Mattel, two lines that are fantastic toys first, and collectibles second. But if Mattel can create well articulated, great looking action figures in a 6 - 7" scale, then Playmates should be able to do it as well. The neck joints on all three figures function as simple cut joints, allowing the head to turn side to side. On Uhura I was able to get some slight tilting, but not enough considering the simple design of these figures and that lack of any sort of collar or hair that could impede them. The arms are the high point for this category, with good pin/post shoulders and elbows, along with cut wrists. This is good enough for this scale and style, and allows for some good arm poses. The waists are all cut joints too, and there are single pin knees, cut joints at the top of the boots, and T hips that round out the leg articulation. The T hips are just not good enough, however, especially with this scale figure. The legs end up forced very closely together, and you'll need to use some hot water with a quick cold water bath to get them far enough apart to look even reasonable. The leg articulation is barely adequate to keep them standing, and you'll need to use the bases for them to remain upright for any long period. This lack of decent hips pulls my score down a good full star. I couldn't get any reasonably decent looking stances out of any of them, and when I pulled out the DCUC Flash to pose with Kirk, the difference in quality and design of the articulation really hit home. 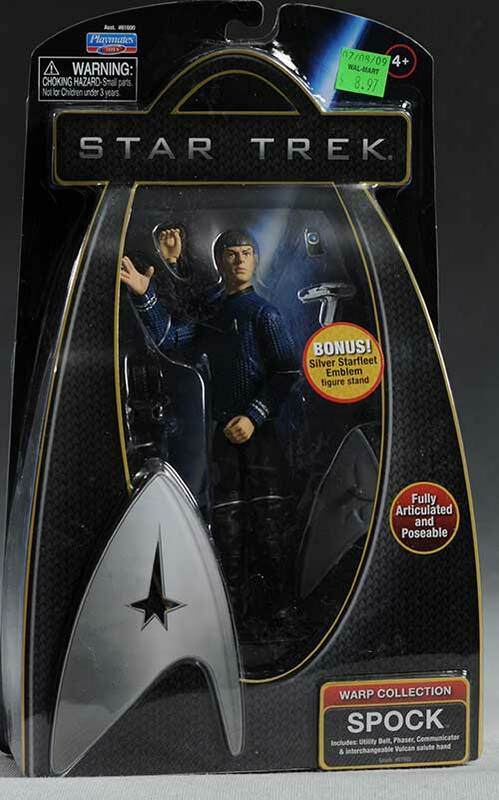 The front of the package proudly proclaims that you get a 'bonus' with these figures - an emblem display stand. Unfortunately, they are fairly cheap (molded in a single color with little detail) and not really a bonus since you'll need to use them to keep them standing for any sort of long period. Uhura's emblem is different than Spock and Kirk in this series, coming in an odd yellow/gold color instead of silver. While most of the accessories are used across the whole line, at least there's a pretty good number of them. All three come with the cool new phaser, as well as the communicator. In this scale, the communicator is much closer to proper size. Kirk and Spock both have a belt to hold these, but Uhura does not. These belts are made from VERY stiff, hard plastic, with a very thin, weak clasp that should close in back. I managed to get mine to work for a short period on Spock, but Kirk's refused to stay closed. Even if you do get it on, it pops off when you breathe in the general direction. The shirt is made from soft rubber...why not the belts? Unfortunately, that's it for Kirk. I suppose being the main man should be reward enough, but I think he deserves something more. 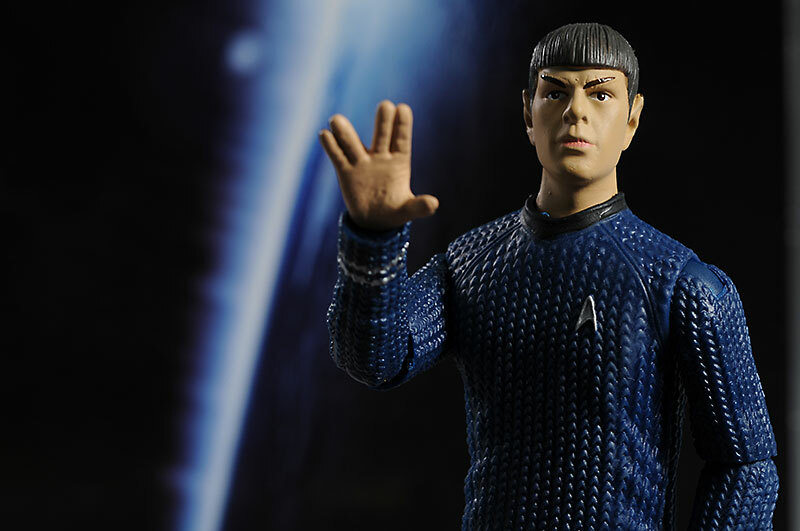 Spock has an additional accessory in an extra gripping hand. Be very careful popping the hands off and on, as the wrist peg is very small and fairly soft, easy to tear or bend. The wonky legs hurt this category quite a bit. From the waist up, their pretty fun toys, but shouldn't all the fun be from the waist down? That's always been true for me. This scale of action figure, even the mass market, mass production stuff, are running $10 - $12 these days. Although I'm disappointed in the articulation and paint, the accessories are better (at least in quantity) than usual, helping them retain an average value rating. Once you have them open, you should be good. While the articulation isn't great for posing, it is sturdy and should hold up to play well. But when you're picking them off the shelf, watch the paint - it's been a big problem across the whole line, varying quite a bit from figure to figure. 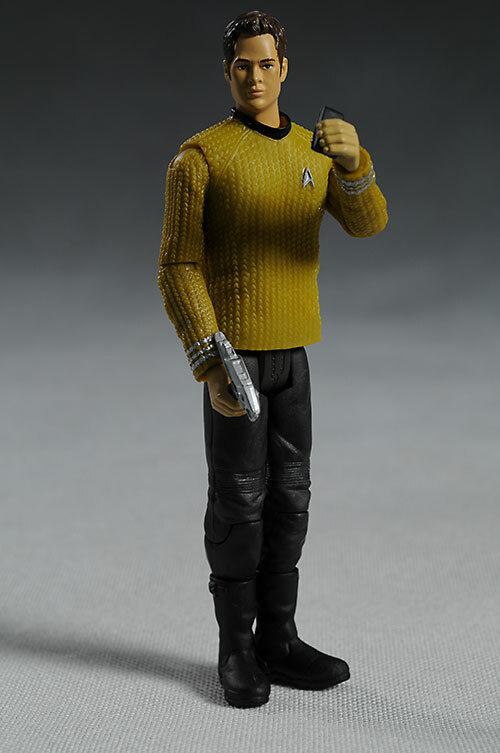 Ah, and don't forget that the pegs are easy to tear on Spock's right hand. You don't want him stuck forever flashing his Vulcan gang sign. While these are intended for kids, it still doesn't excuse the lackluster articulation below the waist, and the rather rudimentary sculpts and paint. The work that Art Asylum and DST did for the Trek license several years ago is much better than this, and with that passage of time, things should improve, not worsen. Still, the Spock and Uhura aren't horrid, and if you're a fan of the scale in general, you'll probably be happy enough with some of these. This isn't a line that's going to end up on anyone's best of lists, and might end up on some worsts of lists, but it's still an improvement over the 3 3/4" offerings. Oddly enough, I'm more likely to complete the smaller scale though, and will most certainly continue to pick up the 12" figures. The larger figures are the best of the overall line up, and while the smaller figures are the weakest, the cool bridge and transporter play sets go a long way to making up for their deficiencies. This scale doesn't have the quality of the larger figures, or the play sets of the smaller, making it my least favorite of the three. - Entertainment Earth has a case of 8 for $87, or a the full wave 1 set of 10 for $99. 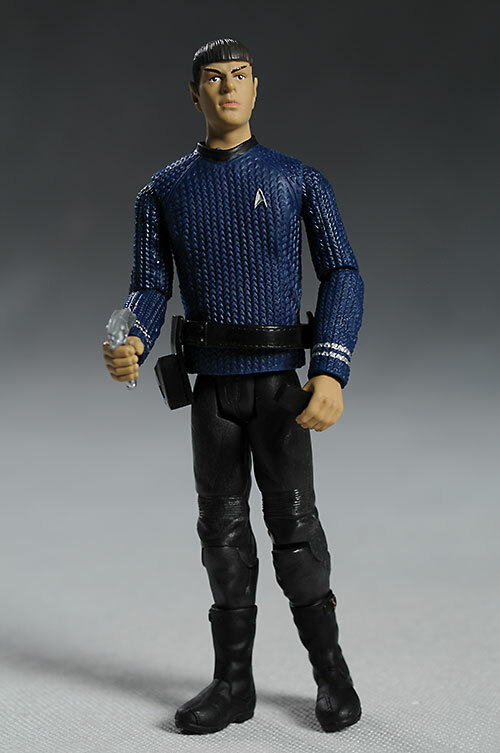 - there's a great guest review of the first wave, along with a guest review of some of the Trek mini-mates.